A once-swollen stream of sign company lawsuits approached a trickle this week as the 9th Circuit Court of Appeals shut the door on an effort to legalize multi-story supergraphic signs that once adorned the sides of two Sunset Blvd. office buildings. A three-judge panel of the court ruled that a lawsuit by Paramount Contractors seeking to legalize the signs was moot because the city last year banned any new supergraphic signs in the Hollywood sign district, where they had previously been allowed. According to court records, supergraphic signs were first put up on the buildings five years ago, under a provision that allowed temporary signs for a limited period of time. Paramount Contractors was cited by the city when it failed to remove the signs at the end of that period, and then sued the city, seeking an order to allow permanent supergraphic signs. A U.S. District Court judge ruled in the city’s favor, and the firm appealed to the 9th Circuit. The case, argued before the panel three weeks ago, represents another in an unbroken string of legal successes over the past two years by the city attorney’s office in lawsuits challenging the city’s sign laws. Those lawsuits in federal court once numbered in the twenties, but only a small handful remain active. One of those, Vanguard Outdoor vs. City of Los Angeles, was argued before the three-judge panel at the same time as the Paramount Contractors case, and a decision is pending. 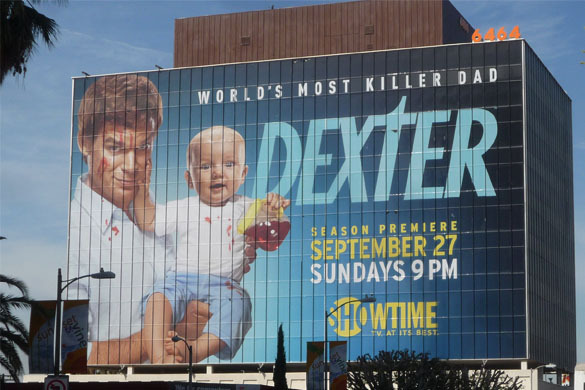 The city attorney’s office has also filed a lawsuit against Paramount Contractors in Los Angeles County Superior Court, seeking fines of $2,500 a day for the time the illegal supergraphic signs were displayed on the buildings at 6464 and 6565 Sunset Blvd. The lawsuit also names Vanguard Outdoor, the company that erected the signs, and seeks disgorgement of revenue earned from the signs. Filings in the federal court case alleged that the city had once offered to legalize the illegal signs in return for fees and considerations worth more than $2 million. The company considered that demand excessive, according to the court documents.